Classes start March 2nd, 2017! 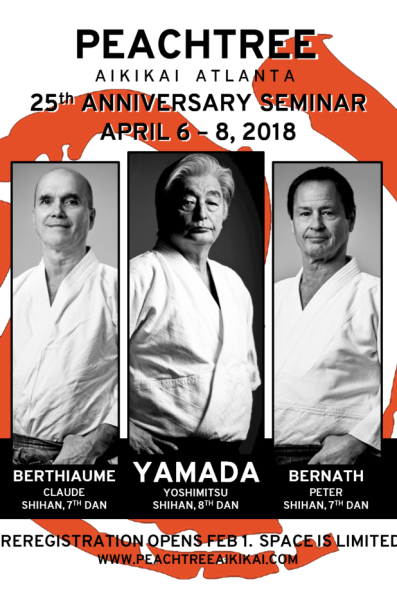 Peachtree Aikikai Atlanta is proud to celebrate 25 years of dedication to the arts of Aikido and Iaido with a very special seminar on April 6-8 2018. Guest instructors include: Yoshimitsu Yamada, 8th Dan, Shihan Chief Instructor of New York Aikikai in New York City. Chair of the United States Aikido Federation and the USAF Technical Committee. Claude Berthiaume, 7th Dan, Shihan Chief Instructor of Aikido de la Montagne in Montreal. Chair of the Kiyoikaze Iaido Federation, and United States Aikido Federation board member. Peter Bernath, 7th Dan, Shihan Chief Instructor of Florida Aikikai in Ft Lauderdale. United States Aikido Federation board member. Sensei Dee Seabolt, Shidoin, Yondan (4th Dan) Cheif instructor, Aikido Center of Jacksonville Georgia Southern University Recreation Activity Center (RAC) 2687 Bunny Akins Blvd., Statesboro, GA. 30458 9AM-5PM $50 Lunch included.